It has been decided to hold the Parliamentary debate on the reports of the bond commission and PRECIFAC on 6th February. As the Elections Commission had informed Parliament that holding the debate on the 8th would obstruct the election a meeting of the party leaders was convened to have the debate before 8th. Despite no decision could be taken at the meeting, the Speaker had a discussion with the Prime Minister before taking the decision to convene the meeting on the 6th. The Supreme Court has issued an interim order preventing the election to the Elpitiya Pradeshiya Sabha. The order has been issued after considering a petition filed by the Democratic United National Front (DUNF). 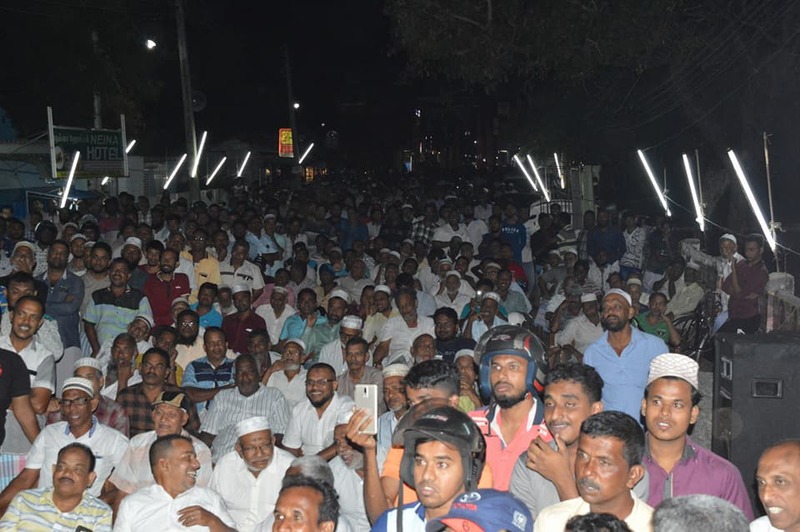 Another rally of the series of rallies held by the JVP for the local government election was held at Kanthankudy town and a massive crowd attended the rally. 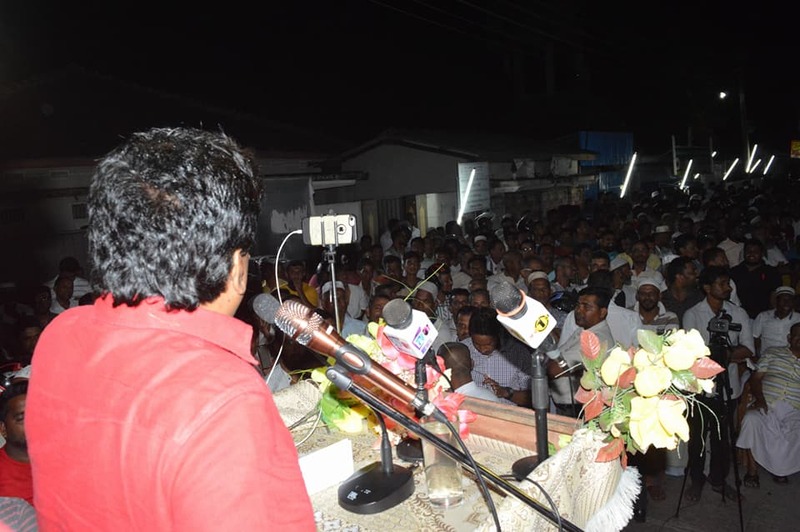 The rally was chaired by the Leader of the JVP Anura Dissanayaka. 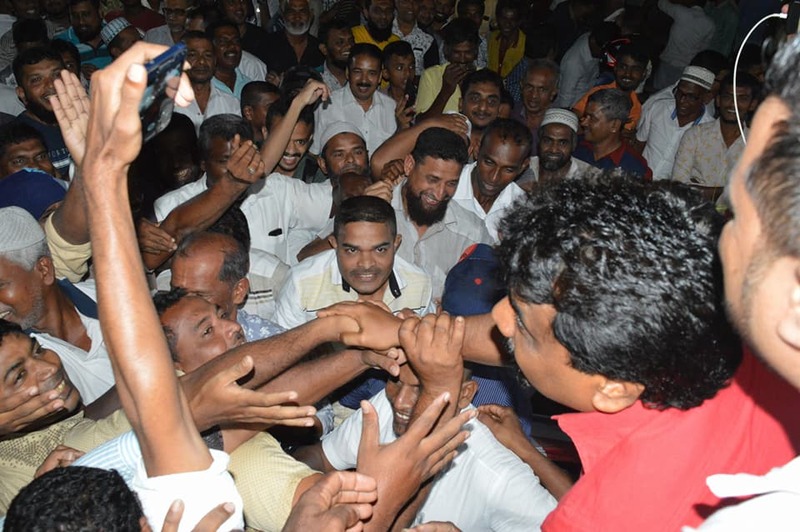 JVP Parliamentarian Sunil Handunneththi and several others also spoke at the rally. “We ask the debate on the two Commission reports should be held before 7th February. We are not concerned about President’s thug talks. He could use his executive power to convene the Parliament. The President had convened Parliament using his executive powers during the Meethotamulla catastrophe even when the Prime Minister was not in the country at the time. As such, we propose to the President to convene the Parliament without making bogus challenges. People should be made aware of the things in the reports. There wouldn’t be enough time for these matters to go to the people if the debate is held on the 8th and the 9th. 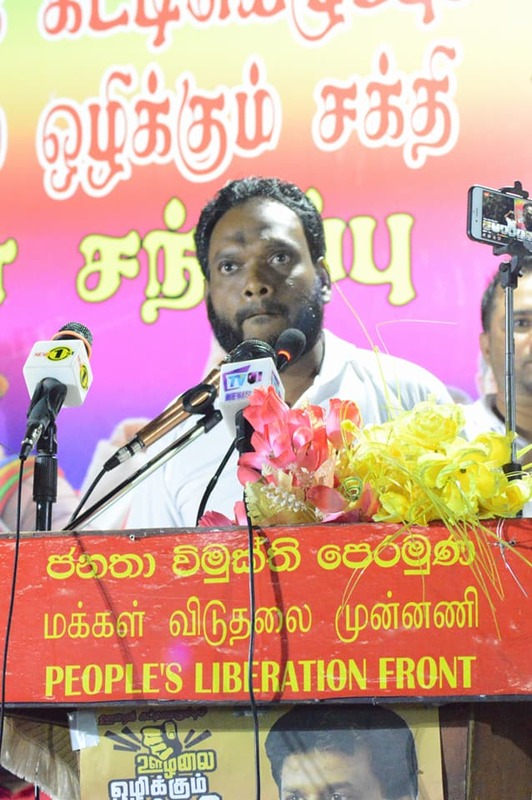 The debate should be held before the 7th so that people could know what’s in the report,” said the Information Secretary of the JVP Vijitha Herath speaking at a press conference held at the head office of the JVP at Pelawatta yesterday (29th). He said, “The reports on the bond commission and the Presidential Commission to Inquire and Investigate into Serious Acts of Fraud and Corruption (PRECIFAC) were presented to Parliament on the 23rd. We asked for a debate on the two reports. Other parties in the opposition too asked for a debate. At the party leaders meeting held on the 22nd, we said the debate should be held before 10th February. However, Lakshman Kiriella rejected it. At the party leaders’ meeting held on the 24th, we again called for a debate on both reports. However, the government rejected having the debate before 10th February. When Lakshman Kiriella rejected having the debates before the 10th Ministers Mahinda Samarasinghe and Nimal Siripala de Silva were present. Meanwhile, the President challenged to have the debate on the bond report before the 10th. The President further emphasized that the thefts of the gang of robbers should be exposed. We wrote to the Speaker again based on this statement of the President requesting for a party leaders’ meeting to decide on the debate. Later, the government had stated the 8th and 9th would be assigned to the debate. However, the Commissioner of elections has said if the debate is held on those two days the election will have to be postponed. He has said publishing the reports on the debate by the media would have an impact on the election. 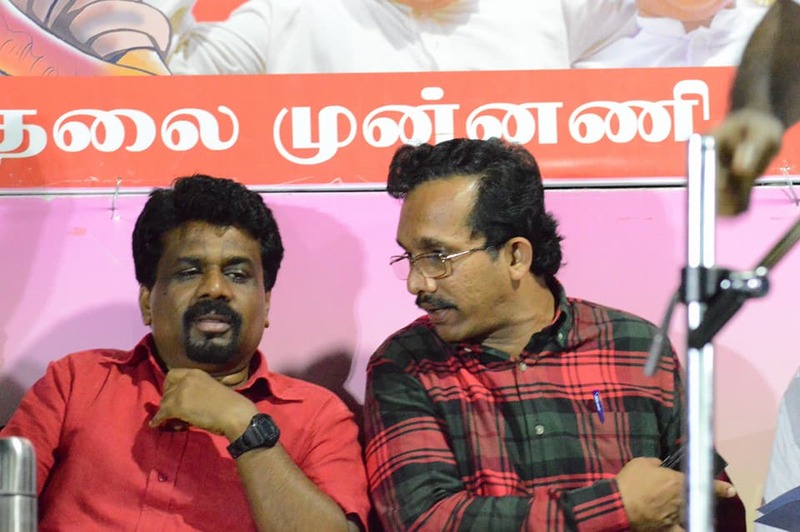 We, of the JVP, as the opposition, ask that the debate should be held before 7th February. We are not concerned about President’s thug talks. He could use his executive power to convene the Parliament. The President had convened Parliament using his executive powers during the Meethotamulla catastrophe even when the Prime Minister was not in the country at the time. As such, we propose to the President to convene the Parliament without making bogus challenges. He could use his executive powers to convene the parliament. People should be made aware of the things in the reports. There wouldn’t be enough time for these matters to go to the people if the debate is held on the 8th and the 9th. The debate should be held before the 7th so that people could know what’s in the report. There are 946 pages in the bond commission report. There are 206 annexures. The total number of pages is 1152. The President in his special statement said there were 1257 pages. There is a difference of more than 100 pages in the one the President talked about in his special statement and the one that was presented to Parliament. We have questioned regarding this. The Speaker said according to the explanations of the Attorney General and Presidential Secretariat there is no difference in the number of pages. As such we proposed to summon the Secretary to the President to Parliament to get an explanation. However, the President has invited party leaders today (29th) at 9.00 a.m. to discuss regarding this. There is nothing to discuss. If there is a difference in the number of pages the President should explain it to the people. If there is a mistake it should be corrected. If the pages in the reports have been placed apart for legal purposes the people should know it. Another report as important as the bond commission report has been handed over to the President recently. It is the report of the Presidential Commission to Inquire and Investigate into Serious Acts of Fraud and Corruption (PRECIFAC). It includes investigation reports of 34 incidents. Most of these reports are on investigations that had been completed in 2016. An immediate inquiry should be carried out on them. For the report of PRECIFAC too is equal in size and weight as the bond commission report. Both these groups are thieves. An immediate debate too should be held. These 34 reports should not be allowed to be covered up by the bond commission report. There are also many investigations carried out by the FCID and the Bribery Commission. These inquiries too should be completed. However, all inquiries have been halted. The individuals connected with the incidents relevant to PRECIFAC are with the President. There is an investigation report on former Minister of Fisheries Rajitha Senaratna. It was handed over to the President in October 2015. The investigation report against Anura Vidanegama regarding lands in Mahiyanganaya was handed over to the President in April 2016. He is now the Mahiyangana organizer for the President’s party. The report on illegal propaganda activities of Mahinda Rajapaksa during the presidential election was handed over to the President on 28th April 2016. The investigation report on Chilaw – Kurunegala Plantation Company was handed over in August 2016. Jagath Pushpakumara responsible for this crime is with the President at present. The report on Rakna Lanka was handed over on 1st September 2016. The investigation report on former Chief Minister S.M. Ranjith was handed over on 27th October 2006. The report on Coconut Research Institute at Lunuwila was handed over in 2016. The report on Srilankan Airlines Catering Service was handed over in October 2017. Then Minister was Priyankara Jayaratna. The President is talking about appointing a new commission when already matters have been revealed. The report on the Transport Commission was handed over in January 2017. The report on frauds and corruption by former Minister Basil Rajapaksa was handed over in June 2017. The report on the ‘Karadiya Mangalya’ in Hambanthota was given to the President in 2016. The loss to the Fisheries Corporation is about Rs. 90 million. The loss to ITN is Rs.235 million. 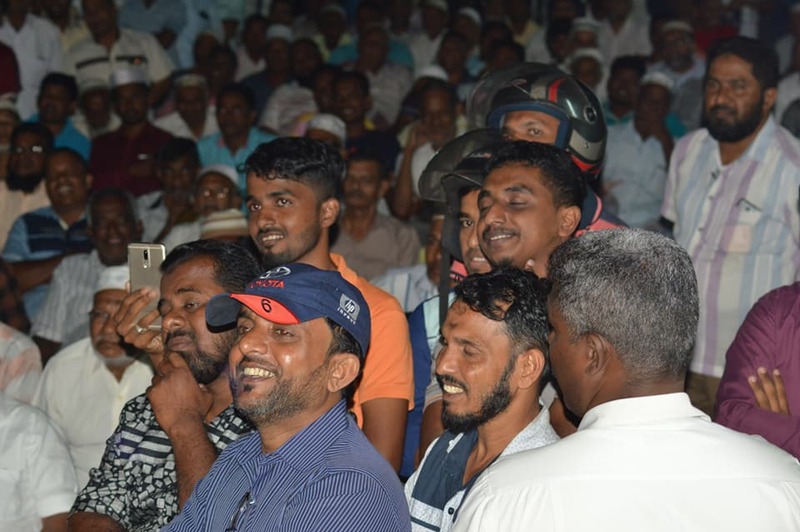 The loss to Chilaw Plantation Company and employees of Rakna Lankadeploying for the presidential election campaign is Rs. 700 million. The loss at SriLankan Catering Company is Rs. 30 million. The loss at National Rupavahini Corporation due to using it for Mr Mahinda Rajapaksa’s election propaganda is Rs. 375 million. The loss due to illegal dealings in the National Youth Services Council is Rs. 20 million. Those who were involved in these illegal dealings are with Maithri group as well. Indika Nalin Jayawickreme who stole from the funds allocated to build latrines for ‘Dayata Kirula’ exhibition at Ampara is a candidate from Mr Maithripala Sirisena’s faction. Among the accused are Wimal Weerawansa, Jayantha Samaraweera, Mohammed Mussamil, Piyasiri Wijenayaka, Priyanka Jayaratna, Padma Udaya Shantha. Some of them are with Mr Maithripala Sirisena. When Mr Basil Rajapaksa was the Minister he had used 11 vehicles in addition to the 3 official vehicles. The total number of vehicles is 14. In addition to 7 VIP security personnel, he had 64 from the Navy and 84 from the army for his security. It was also revealed that female naval officers were deployed to fix the saree for Basil’s wife. Investigations should be carried out regarding these crimes. The Speaker said the annexure of the Presidential Commission reports has to be carried in a wheelbarrow. The investigations regarding findings of both these Commissions should be expedited. What we said about both these groups being rogues is correct. As such, a Parliamentary debate is necessary regarding both these reports. The things about both these reports could be revealed only in such a debate. We ask the President to wield his sword instead of coming out with empty talk. If Mahinda and Maithri factions combined these facts would not come to light. No decisions were taken despite the reports had been handed over a long time ago as they expected to join forces. The President did not punish the thieves with the whip nor will he cut with his sword.